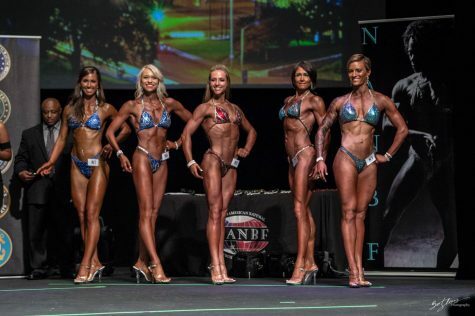 Swickard (middle) stands on stage displaying her figure to the judges and crowd. 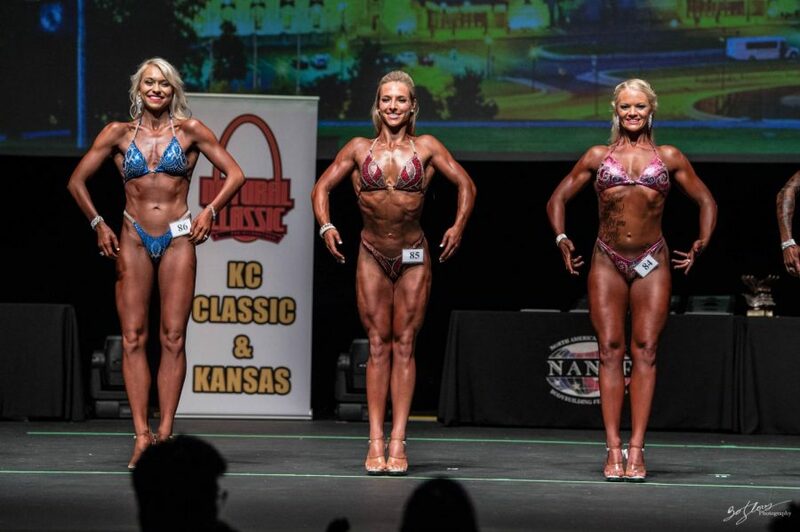 Female bodybuilding: A serious sport that is sometimes overshadowed by male bodybuilding, but sophomore Riley Swickard decided to take on this obscure world. Swickard began a fitness journey in 2015 that would lead her to perform in a bodybuilding show, find a passion for health and fitness, and to a create an Instagram account aimed at inspiring others to share her lifestyle. Swickard began by changing the foods she consumed. She started a ketogenic or “keto” style diet, which focuses on high fat intake and a low number of carbs consumed. Along with the new diet, Swickard started to lift weights and do more cardio. Through that process, she lost almost 30 pounds. As she began this lifestyle change, she realized that her personal health and fitness were extremely important to her, especially as a student-athlete. Swickard plays outfield for the Baker softball team. She decided it was time to focus on her body’s strength, which included a new nutritional plan with higher carbs. During this time Swickard started to become more toned and lean, especially as the softball season progressed. She started lifting more seriously, which quickly became a new form of stress relief. After spending two years with a personal trainer, Swickard was encouraged to try bodybuilding. “I thought [about] the bikinis and the stupid posing I was like, ‘Oh wow, that sounds kind of corny, not really my style,’” Swickard said not knowing this would soon be a major part of her life. Trainers Dawn Clifford and Janna Teefey told her she wouldn’t have to do much more work because of how fit she already was. “She could have walked on stage after her first season of softball,” Clifford said. Teefey first noticed Swickard in a group workout class that she was coaching. Swickard’s “beautiful muscle mass” stood out to her from across the gym. The last thing standing in her way was the cost, but the gym offered to purchase the swimsuit necessary for competition, a $400 to $500 investment. After deciding to seriously compete in bodybuilding, the real work in training and meal prepping began, which was no small feat. The week before the show, Swickard was eating every three hours was always cold due to only having six percent body fat and being extremely fatigued. The restrictive diet plan inspired Swickard to make a list of all the things she wanted to eat and all the restaurants she wanted to eat at after the show. On show day, she was nervous and a little uneasy. The culture of bodybuilding is very distinct and was not something Swickard loved about the sport. After getting her spray tan, gluing her swimsuit on with carpet glue and receiving compliments about her lats from strangers, Swickard was ready to take the stage. In her first time on stage, Swickard was named “2017 Ms. Kansas Figure” and “Overall Novice Figure.” She hopes to compete again in the summer, the only thing in her way is the cost. The transformation Swickard’s body went through was extremely fascinating for her. Swickard said it was strange to have people look at her body in the way each judge does, however, at this point in her training she was used to displaying her body in that manner. Judges will have competitors switch around in the line up so they can be compared, all while people are yelling out from the audience at the competitors on stage. especially because most people didn’t even know she was competing in bodybuilding. 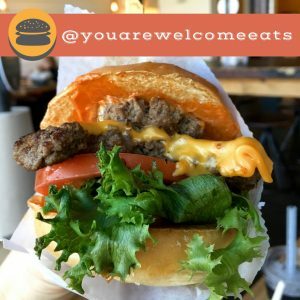 @youarewelcomeeats. The name, inspired by the messages she received, serves as a way for her to say “you are welcome” to her friends and followers. The goal of her page is not to become internet famous, but to share the truth about health, food and eating well and to build her portfolio. Swickard is a mass media major on the public relations track. “I hope that it educates and inspires people to care about their health more,” Swickard said. Now that Swickard is back on campus, living in the Zeta Tau Alpha sorority house, cooking her own meals has come with a series of trial and error. With no real kitchen at her disposal, she has learned to cook her meals differently than she did at home. “I honestly just used a lot of YouTube tutorials to see how I could manage and put my own twist on things according to the utilities and utensils that I have,” Swickard said. While Swickard has fostered self-control, she tries not to restrict herself if she really craves something. She doesn’t want to become a “robot,” and tries to share that with her followers. Swickard hopes to continue her Instagram page and live her healthy lifestyle. In the summer, she plans on strengthening the page in her free time and to create a blog without the distractions of school and athletics.